So finally a new outfit again! I’ve been trough many ups and downs in terms of inspiration, mixing and matching stuff but never quite happy enough to post. There comes a time in outfitting when you have “been there, done that” and get bored easily with cosmetics and armour that have already used up their newness. Since the launch of Update 14, the Swan theme has taken over by storm. In Dol Amroth the Swan Knight NPC’s are wearing their Swan uniforms, and it looks like quite of lot of player characters have joined their ranks as well, featuring (parts) of the new Nadhin armour line. The Nadhin armour is available from the quartermasters, but it also drops as Bind on Equip armour, thus making it possible to find pieces on the Auction House as well starting at level 50. Some mighty fine outfit bloggers have been posting very inspiring Swan-themed outfits that I recommend looking at as well: Shiny Steel Plate by Lotro Stylist, Alph and Mithlond Border Guard by Wandering Around Arda. I have chosen the Black Swan theme for my elf. Unfortunately the black swans in the game are currently bugged, featuring a black neck and white body, so I couldn’t take screenshots accompanied by actual black swans. However, some day the bug will probably be fixed and I will have unique screenies of bicolored swans! I miss your posts too and the mutual inspiration that they generate 😦 Maybe we can rekindle some of it? I’m still playing Lotro loyally, and very much enjoying visiting all the new places, it’s just that the outfits aren’t coming along so much anymore. I hope you find some inspiration to create a swan theme too! It’s wonderful to see another outfit posted here, Hymne, despite the lack of inspiration that seems to be traveling around the community. Beautiful outfit Hymne. This outfit is very fresh looking. You’ve breathed new life into old armor pieces. Your pictures are amazing too, very artistic. I love enjoying the story you tell through your photos. Oh my, thank you Devonna for your sweet comment. I’m not a great story teller with words, but I do my best expressing something more than just an outfit in the pictures. I guess it takes one to know one, as you do the same in your own pictures, which are always refined and have a narrative of their own. 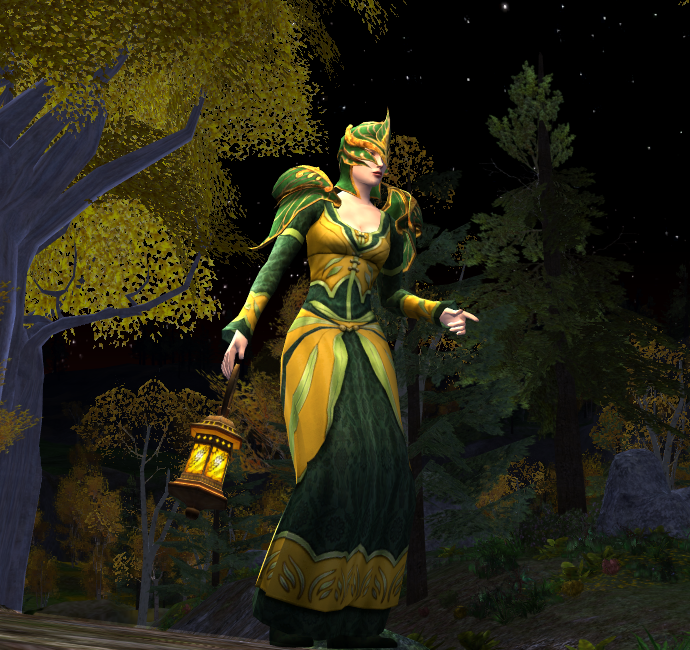 I hope you continue to come back to Lotro every now and again to share some of those images on your blog. It’s dragon-scale armour, Helegrod heavy, Champion. Also available as a cosmetic. The skirmish armour is a different colored version. It cannot be dyed this darkly.